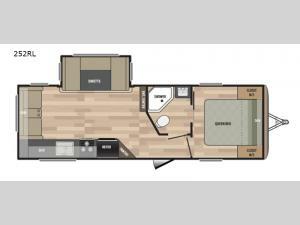 With this Springdale 252RL, you will find a travel trailer that will take you on a trip of a lifetime while still giving you the comforts of home! Some of these features are the front private bedroom that has a queen bed with night stands on either side, overhead cabinets, and an entrance into the dual entry bath. You can comfortably enjoy your delicious meals at the u-shaped dinette, as well as transform it into an extra sleeping space when needed. Inside the dual entry bath, there is a skylight above the radius shower to give you even more lighting during the day, and at night you can still see clear as day with the LED lighting!